How many strands of embroidery floss should I use on my project? When you say one strand, you mean one strand of all six, right? 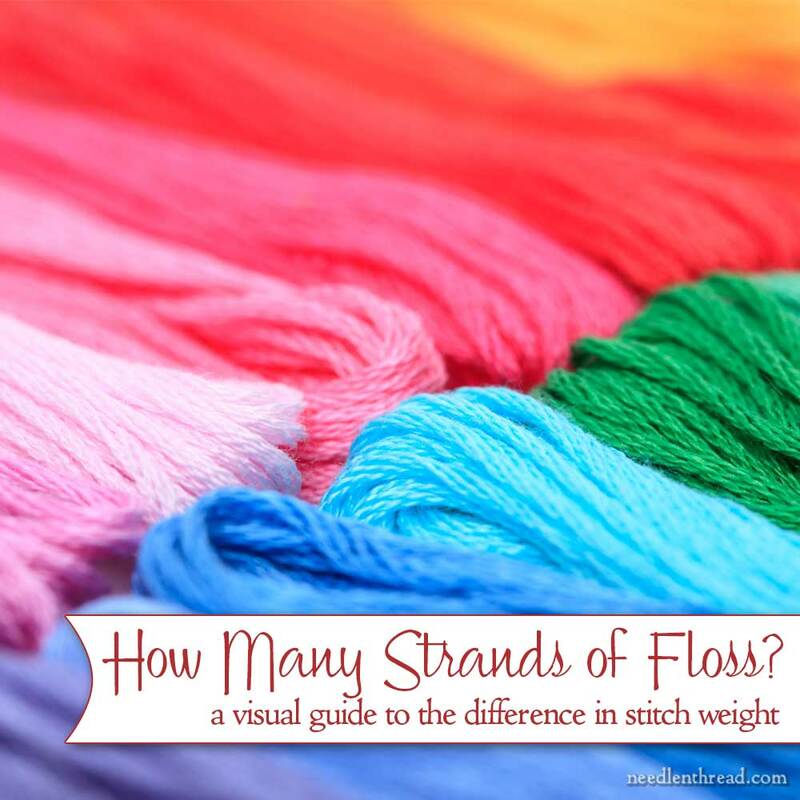 Are you stitching with all six strands of floss, or are you stitching with just one? I get questions about stranded embroidery floss a lot – and especially the first question above: How many strands should I use on my project?. This a tough question to answer! It depends on two points: what you’re embroidering, and what you want it to look like. 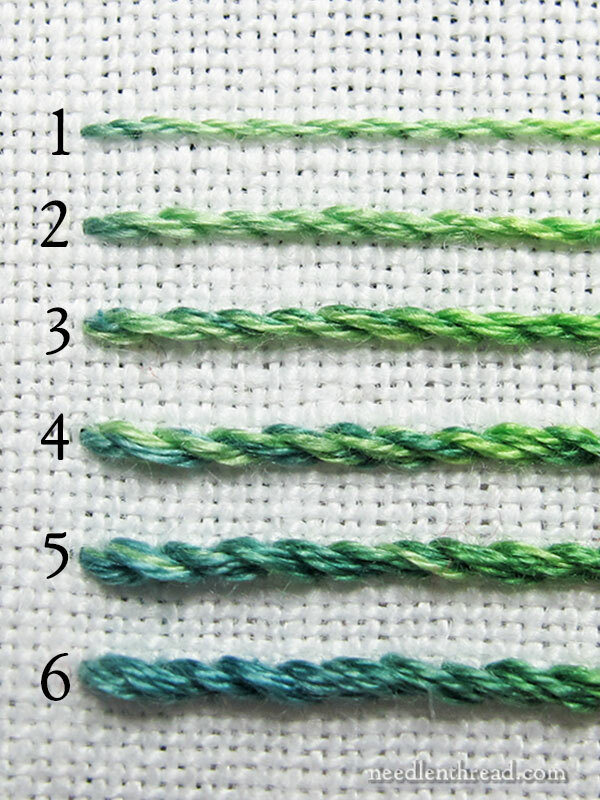 Today, let’s chat about stranded embroidery floss and look at the difference between stitch weight with different numbers of strands. When using stranded cotton embroidery floss, stitch weight – or the heaviness or lightness of stitch – changes with the number of strands used. When you pull embroidery floss of the skein, it comes off in a rather thick thread that can be separated into six much smaller strands of floss, each of which can be used individually or with any other number of single strands put back together again. The more single strands you put back together to stitch with, the heavier your stitches will be. Starting at the top of the photo above, we have a line of stem stitch worked with one tiny, single strand of embroidery floss. The stitches are approximately 3/16″ long. You can see that one single strand of floss makes a very fine line. Progressing down the photo, each row adds one more strand of floss, until the last row, when all six strands were used in the needle at once, straight off the skein, without separating the floss first. In each row, I kept the stitches the same length – about 3/16″. Keeping the same length of stitch and increasing the thickness of the thread substantially increases the weight of the stitch and the thickness of the stitched line. In craft embroidery today, it is quite common to embroider (especially in backstitch) with all six strands in the needle at once. This creates that chunky, cute style of embroidery that’s very popular right now. If you want to refine your embroidery and manage more detail with finer stitches, you can decrease the number of strands until you find the weight that looks right with whatever you’re planning to stitch. If you want a bold line that can still manage decent detail, start with three strands. If you want a finer line that’s still easily visible, try two strands. If you want a very fine line for delicate detail, one strand will do it! There are certain stitches, though, that work better when you’re just using one strand of floss, especially satin stitch and long & short stitch. To achieve the smoothest finish on both of these stitches, one strand of floss works best. Did you know that your thread weight and stitch length can effect your ground fabric? 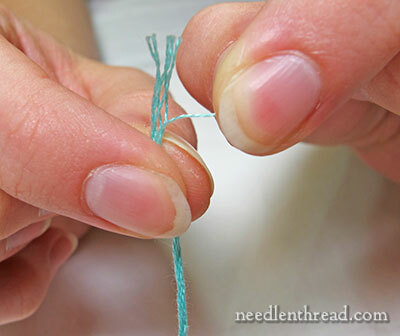 If your thread is quite heavy (say, six strands of floss in the needle at once) and your stitches are very small, your fabric may very well pucker, regardless of whether or not your tension on your stitches is correct. If you’re using all six strands of floss at once, your stitches should be slightly longer than they would be if you were using only three strands, to give the thread plenty of room so that it doesn’t pinch the fabric. Do you have any questions about stranded embroidery floss? Any insights, suggestions, or tips to add, especially for beginners who might be just starting out with embroidery? Many heads are better than one, so feel free to join in the discussion below! A couple articles that will help you get the best stitching results when using stranded cotton floss: How to Separate Floss (a step by step guide to preparing floss for use), What’s a Laying Tool? (explanation of a laying tool and how it helps improve embroidery); and How to Use a Laying Tool (further information on the laying tool and a video to show you how to use it). Good topic! Not the easiest lesson to learn. I like heavy coverage, in general (maybe my tension could be a little looser? ), so I have learned to take a designer’s listing as a guideline. Even within the same thread line, some colors may be thicker or thinner. Advice I’ve seen from you and others is, if you aren’t sure, try the stitch *with the thread and color you intend to use, on the fabric you intend to use*, and go from there. If I’m not happy with the test, I probably won’t be happy unless I make changes. The more I stitch, the more valuable this lesson has become. Thanks, and have a happy Thanksgiving! I’m working on a project using a twisted 2 strand DMC #5 perle cotton and I can’t spilt the threads well I can spilt them but they break when I try to stich with them. Are you not supposed to spilt that kind? This is my first project so i’m learning as I go. So, what I’m working on probably looks like a sampler to many cause every time you introduced a new stich I added it in some way, everyone says it’s beautiful so thank you hopefully I’ll get to share it when I’m done. Perle cotton is a pretty sturdy thread – I can’t imagine it breaking during stitching. Perhaps you’re using pieces that are too long, and they’re wearing down towards the end, and that’s why they’re breaking? You can definitely split stitch with perle cotton #5 – it’s a non-divisible thread, and you should be using a crewel needle with a sharp point to split it. But make sure your stitches are long enough so they don’t end up too tight, and don’t pull your thread too much. did you mean you are having trouble with it breaking when you embroider in split stitch or that you are trying to split up the threads of Perle cotton into two pieces to stitch with and its breaking then? I believe Perle cottons are not a divisible thread, they are meant to be stitched with as is and not divided, unlike floss. If you’re trying to split perle cotton, it won’t work. That’s meant for larger and heavier stuff. Mary’s talking about stranded floss – it comes in the little flat skeins in the store, instead of hanging on the rack in the twisted skeins. They’re usually about .40 a pop. Good luck on your sampler! Another thing I have found is that some dye colors seem to be absorbed differently and create a different weight on the threads. While working a piece of needlepoint on 14 canvas most colors ware fine using 6 strands. The dark blue did not cover sufficiently and I had to use 9 strands for full coverage. Dear Mary. Thank you for sharing your embroidery expertise. Separating embroidery floss can leave you in knots. I usually twist the thread to separate the strands, sometimes I will pull the thread. Separating threads does make a difference in the appearance of your needlework. The length of thread is also important. I have learned that too long threads can get tangled and the thread can thin as it passes through fabric. A length of 12 to 18 inches is adequate. Thanks again for sharing your knowledge and the wonderful instructions, pictures and information. A friend told me that 3 threads on 14 count perforated paper is the rule, however (ever since she said that) I only see 2 recommended in the directions. Any thoughts – is it just how you want it to look- fat & puffy or sort of slim? Yes, it depends on the look you want, I think. I’ve stitched with various strands of thread from a single strand for finer detail to all six strands for a chunky look when I want a thick boarder. I agree with you that it depends on the look you are trying to achieve, but I wasn’t aware that using more strands can pucker the fabric, so it is very useful to know to extend the stitch to prevent pinching of the fabric. The visual guide showing the different look of the same stitch is very helpful. A great article and thanks so much for the tips and techniques on the number of strands to use in embroidery. Newbie here again with more questions. Have been trying to learn how to “write” words using the stem stitch. Watched your tutorial etc, but there must be some subtle trick to a smooth line like those pictured today. Am using two strands of DMC thread. Any hints or advise would be wonderful. The trick that I found useful with lettering is to subtly shorten the stitch length when rounding corners. It seems to help prevent the spikey look. Diana, i write alot in the stem stitch and like Mary said you sometimes have to shorten the stitch and i find when going around corners i will make sure the loose thread goes out toward the curve, that will make it turn more smoothly. and sometimes ( only if i have to) i will make a very tiny couch stitch on the curve that isnt looking unified. hope that helps more then confuses. Didn’t you write an article once comparing the weights/size of standard floss to various pearl threads? I see it in my mind but can’t remember where I saw it. I do a lot of needle painting. As you said, one strand of the six strands of stranded cotton. To supplement my needle painting I also make use of no 40 sewing machine embroidery thread which is even finer that one strand of stranded cotton. I use these threads for really delicate stitching. Here is an example where the complete image was stitch in just sewing machine embroidery thread. After you cut the thread from the skein if you look at both ends one end is a little fluffier then the other. I call this the blooming end. If you pat the blooming end and pull a strand it will come easier and will not be as likely to knot up on you. Mary, Your timing is impeccable. This was exactly what I needed to know today! Thanks for your wonderful blog. You’ve taught me so much already! I do have one question, on the example of 6 strands, why didn’t you separate them and put the 6 strands back together? In other words why did you use the 6 strands as it came off the skein? Hi, Nan – well, normally, I would have separated them, because I rarely use floss without separating it first and then putting it back together. But most craft embroiderers who use the full six strands tend to use it right off the skein, so I wanted to show that effect. It isn’t quite as smooth, but the size is about the same. Very informative post ! And pictures/diagrams that depict comparisons are Always preferable to lengthy text – a bird’s eye view. I have a minor tip to share – might be obvious to some, but helpful to others, especially beginners : choose a needle size to complement the number of strands chosen for the project. Finer needle for 1 or 2 strands …. and larger for 6 strands. Also, I prefer shorter needles when embroidering with single strand, because it provides greater manoeuvrability & grip. Do you concur, Mary? Would love your expert opinion. Great article again, Mary! Because I’ve only done ecclesiastical embroidery to date (only started embroidering around March this year), I’ve only used either 1 or two strands of floss. So this is very helpful to me and a “keeper”. It also gives another point to keep in mind when I stitch so I don’t end up with puckering/dents is to lengthen my stitches a little as I tend to stitch really small. Either a larger needle as noted from your article last week &/or too small stitches are causing this problem in my current project. Thanks again Mary – your instructions, suggestions, advice and knowledge are a great help to me. How many strands (for me) also depends on what I am embroidering. If the area (like an eye) for a character on a military style shoulder patch sized project, one strand is often what is needed for the (face) eye. I could do the background with two or three strands, but the eye, would need just one, and if I used more it would not even work. I learned that while doing a copy of a ww2 military shirt patch for an e-reader pouch for my father. Mary, no one has addressed my question about how you achieved such a smooth line with your stem stitch….so far. But maybe you have in another way…..is it important to not only separate the threads, but to allow them to “straighten” out or “unwind”???? Get the kink out so to speak? would that make a difference/smoother line? Since I am so new to trying this stitching on my own with only your blog to guide me I may be asking really dumb questions. Or obvious ones. So would like to hear a comment re: smooth looking stem stitch. I also wrote you privately asking if what I am attempting is called Crewel or Embroidery….I did just get some Milliner needles yesterday, but the eyes are so small, I wonder if I will be able to get 2 strands of DMC floss through the eye…….what number should I have looked for???? Happy Holidays to all and thanks for any suggestions. For even & neat stitches, when making the next st, bring the needle back up through the exact point where the previous st ends. It creates a very neat and even line, with the sts in kind of a spiral, like you see in the pic. About thread strands : you are right about the ‘untwisting’ while embroidering. To avoid this, I periodically pull the needle down thru the thread upto the fabric. Then, pinch the thread between index finger & thumb, and ‘pull’ thru the entire length, a couple of times. This helps the thread twist back into position. This ‘kink’ also occur when one is separating the strands (probably what you meant to ask?). So, before threading thru needle, caress it back into original twist (just as I explained above). Any suggestions on thread count when using Anchor M101 gold floss on fine weave cotton poplin vs. Heavy raw silk? Hi Mary, I was wondering when you do your eclesiastical embroidery, what is the average number of threads that you use and if you use only one strand, does it take longer to fill out your design? Thanks so much! I love all of your articles and newsletters! mary- what a delightful topic, i get asked that all the time when i teach my embroidery classes at the extention office. i try to tell them what looks and feels best to you. one stepi always must show,(and i learned this in the EGA) is that to separate the strands one should pull straight up a single strand at a time and if adding more than one to needle always make sure they are flat and straight, it will make a better stitch and will have more sheen. by the way i love love love the colors you picked for the beak. Roseworks in South Africa. I find the stitch illustrations difficult and thankfully have found your website and videos. I have been instrcuted to do a split stitch using ONE strand of DMC floss which seems almost impossible. Can you help? Hi, Martha – well, I have to admit, I like split stitch best with just one strand of floss (or any single strand of embroidery thread). It might help if you put a little tension on the stitch from behind – maybe pull a little bit on the working thread with one hand, while you’re bringing the needle up from below with the other hand. If you can make the stitch stay still and flush with the fabric, it’s much easier to split it. Another thing – if you’re not using magnification, or at least a really good light, consider it. Even if you don’t have any vision difficulties, it does make a huge difference to have a really good stitching light (or a very sunny window!) or even a magnifier, when you’re working with one strand of floss. Hope that helps! H, Christine – I think you get better coverage on 14 ct using three strands, so I’d go with three. But that’s just my opinion! I’m not a beginner but haven’t put needle and thread to fabric for quite a while. I have always struggled with how many strands of floss to use to get the “correct” look without trying it multiple times with different thread counts. Your tutorials are fabulous for those long-forgotten stitches, but I believe it would be helpful to say in your introductory statements of how many strands you are using just to give your viewers (especially beginners) an idea of what the stitch might look like if they decide to add or take away strands. Just a thought? Howdy…I’m new to this…my mom wants me to embroider a lazy daisy/back stitch design in felt…should I go ahead and use all 6 strands or maybe 3? I know it will be a bit difficult in felt…any suggestions would be greatly appreciated. ..thanks! Hi, Elyce – felt is pretty easy to stitch on. Just make sure you’re using a crewel or embroidery needle with a sharp tip. You might experiment with the number of strands, to see what look you like best. Thank you so much for explaining this! The crazy quilt instructions I am following do not discuss this dilemma. I needed to know how many strands to use as I am crocheting amigurummi animals and some have a felt nose or mouth… embroidery floss is used to stitch them onto the animals, and it’s been years since I used the floss. I am trying to figure out the best needle size for 6 strands. I’m doing a piece that is all 6 strands and I don’t want to get frustrated. Also are you aware of any threading tool that would help to thread 6 strands? Hi, Terri – I’d try a #3 crewel needle. If that doesn’t do it for you, a #1 is larger and would work, but I think a #3 is probably sufficient. Once you have the right sized needle, any thread will work. I prefer the flat threaders that are hook shaped – they hold up better than the little wire things. The Instructions on my cross stitch sampler says to use 6 strands of floss over one thread. What is meant by this? I have a pattern that requires dmc flower thread. It is discontinued. I have a color conversion chart but I am not sure of how many strands of floss are equal to flower thread. I have started my journey with embroidery after retirement, found your blog and love the instructions and encouragement. Your work is beautiful, vivid and so bright with color that make my heart sings. I would like to try some small steps first since I am new to embroidery. Finding the cotton embroidery thread on line is ok for some colors (DMC) but the silk thread is impossible. Most of my purchases are on line. I want to try some silk embroidery thread, do you sell it? Soie d’ Alger silk was one of your suggestions. Hi, Barbara – Thanks for your question! No I don’t sell threads retail. There are a few online shops in the States that do, if you’re located in the US. Needle in a Haystack (California) is the one I’d recommend, because they do have images of all the thread. While you can’t necessarily tell the exact color when looking at thread online, you can get at least an idea of the color, as well as an idea of the way it’s put up (skein or spool) and so forth. Hi, Jo – I’m not sure. I don’t have any #10 crochet thread to compare. I don’t know if there’s a particular formula. I’m guessing a pearl cotton #5 might be a similar thickness, but not certain! That’s ok. I think I’ll just get some #10 crochet thread, lol. Thanks for replying. Have a good day!